We have reached a point at Mercy where many teachers --- if they have not already begun implementing Challenge Based Learning projects-- can see themselves doing so in a coming semester. Consequently, the time has been ripe to discuss the nuts and bolts of CBL. We did not get very far-- I can already see that this is going to be a three part roll-out. But our slow progress was for all the right reasons. We discussed the CBL launch (How much information to share?) and team formation (Should students choose their own groups?). 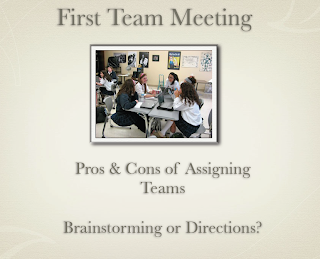 And then we had great discussions about the first steps concerning how much direction the students should be given. Of course at every juncture we are discussing the teacher's role.